How to work with ARM Templates without going mad – Owlotta – ¡Azure! ARM Templates are meant for automating deployments, for better understanding of the ARM concepts consult this document. I’m writing this under the assumption that you are interested in writing your own ARM templates and got lost at some point. Obviously consult ARM syntax. And general ARM guidelines. But this shouldn’t be your case. 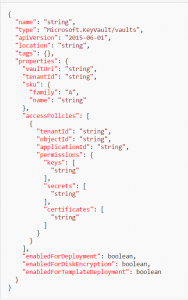 But this document might help you, design patterns for Azure Resource Manager templates when deploying complex solutions. Basics. Where do I start? Well, if you are not interested in inventing the wheel again, I’d recommend starting by finding some relevant examples on the web. All of these are doing exactly the same, they are giving you a way to export existing resources you have in Azure into ARM Template. So obviously you should have those resources in Azure before you export them, but that is pretty easy to do. But bear in mind, all of these ways are nowhere near perfect, they cannot export certain things\properties\parameters, so after you’ve exported a template, read through it (or try deploying) and figure out if something is missing from the template. Working with Azure Explorer is pretty intuitive, so I won’t explain it. It could help you out if you are looking for some specific property that didn’t get exported with “Automation Script”, also looking at already deployed templates could work when “Automation Script” doesn’t. Azure automation option can be used when you are creating resource in Azure using the portal, when you are about to deploy it, you can notice “Automation option” button near the deploy button. The thing with “Automation option” most of the time it uses a slightly different template to deploy stuff, which can help you. How do I fix missing properties? ARM Schemas? no, just no. Documentation by examples? yes, if it helps. Rest API! always works, a bit cumbersome, but never fails. Also some usefull hotkeys for VS Code: Alt+Shift+F - format the JSON template, so it looks pretty and easier to read, Ctrl+Shift+M - find errors and show them. If you select the language of the file as JSON, VS Code will offer intellisense when working with ARM Templates (if you’ve installed extensions). Pretty sure Visual Studio has the same capabilities, I haven’t really worked with it a lot. What is convenient with Visual Studio it allows to navigate between resources in the template (similar to what you can do in the portal). This is pretty useful when you are working with a big template. More information on both: VS Code and Visual Studio. As you probably noticed, some of those are links to another objects in the schema, they could easily be located with a quick Ctrl+F, unless they link to another schema file, in that case, look in that file. Right now your best bet is to use new Azure Template documentation. It offers a more convenient way to achieve the same result you would with ARM Schemas and much faster. Let’s take that one step further, We know that “anything” is possible using Azure REST API. 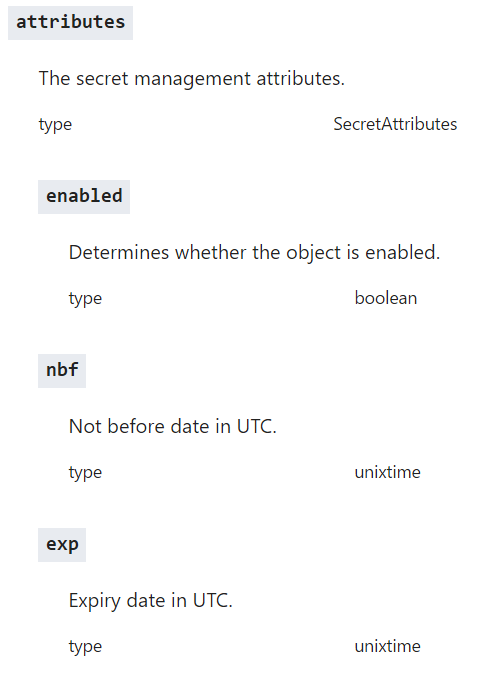 But what if we want to create a secret that is disabled (not that there is a reason for that, but we are just using that as an example) or not usable after certain date. 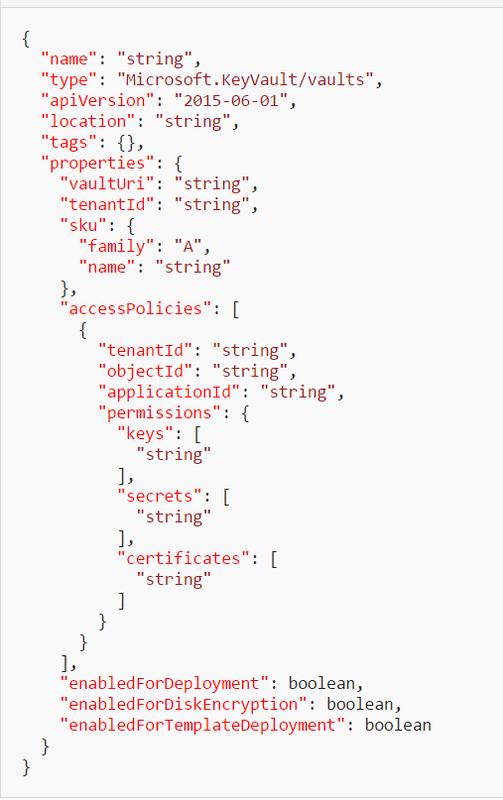 Looking at the REST Api reference for creating a Key Vault secret we can notice that there are properties to do that. In other words, it worked. Well, that gives us an idea on how to extend ARM Templates despite the fact that neither ARM Schema, nor official ARM Templates documentation list those fields\properties as possible. Create and export resources if they don’t exist yet. Remember that there are at least 4 ways to export resource when\after creating, some of those might not work for your particular case. Sometimes ARM engine will throw something like: “Error at line 1, column 2356”, easiest way to handle such an error - minify your JSON and look for character 2356 in the result. 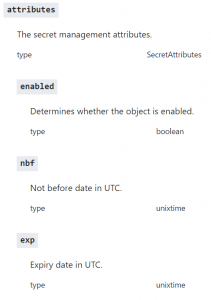 You can use dot notation or  to access object properties. This is important to understand because variable('x').parameter('y') doesn’t work, whereas variable('x')[parameter('y')] does. You can also access array members by their number , sadly [-1] doesn’t work, but there’s last() function for that. I have to take my words back on this one, this is pretty useful if you are just starting to work with a big template that you didn’t put together (or maybe you did but long time ago). So it can be really useful. Reference. This tool can be used to capture existing calls from the portal to convert them to ARM Templates, I’ve used it a couple of times for automating various things. I won’t describe how to work with it, as this is not the main point of this article (and there are tons of resources explaining how to do so). I’ve heard several times that you cannot use reference to other resource in the template outside of the output section. This is false. You can do that (but you also need to pass in “api-version” to the reference function). The only requirement is that the resource should be deployed after the resource it is referencing, which is quite logical. Reference function implies dependancy, so no need to declare dependsOn if you use reference. By using the reference function, you implicitly declare that one resource depends on another resource if the referenced resource is provisioned within same template. You do not need to also use the dependsOn property. The function is not evaluated until the referenced resource has completed deployment.